Choosing the Absa Cape Epic as your first-ever stage race and partnering with a modern legend is not a decision most would take. But American XCO-specialist Kate Courtney is not someone who is afraid of making big choices. 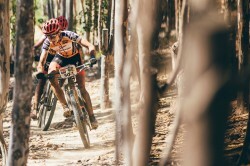 Courtney, the young American regarded as the next big thing in mountain biking, will race the 15th Absa Cape Epic with three-time Women’s category winner Annika Langvad for Investec-Songo-Specialized 2. The Dane, who missed the 2017 edition after she opted to concentrate on finishing her dental degree, will return to an event she has won every time she has raced it. “This will be my first time racing a team stage race and I am really looking forward to sharing the experience of the race with Annika,” said Courtney. “While we have never raced as a team, we have been teammates on Specialized for a few years and have spent time training and racing around the world together. Courtney won four of the six legs of the 2018 UCI U23 XCO World Cup series and thus sealed the overall title. She took silver in the U23 World Championships. A strong climber and good technical descender, she believes her willingness to learn and fresh eyes will benefit the team. Both Courtney and Langvad will take part in the opening leg of the UCI World Cup in Stellenbosch the week before the Absa Cape Epic, which, Langvad believes has played a part in the strength of the women’s field. “I am truly super excited to be back. Missing out on the Absa Cape Epic has brought me a fresh hunger to come back to the race. Last year I was fully occupied during winter finishing my last year of dentistry school.